We thought the Andes climb would be the most difficult leg of our South America trip. We thought that after sailing down the mountainside, it would be smooth sailing for the next few days until our break in Mendoza. We thought there’d be Evian girls serving us ice cold water at every turn. We… were fools. This week, we entered the pampas of Argentina. Defined as, “a flat, treeless, featureless landscape,” my experience now allows me to rally behind this definition. Entrance to the Pampas bore a hefty cost: four days of riding into a relentless headwind that all but impeded any real progress from us. While we did get a nice long break in San Rafael, it’s the rough riding in the Pampas that sticks with us from this section of road. The start of our week was rough. Hard side of the sponge rough. The type of "Riders" we'd be could definitely be deemed... well you get the point. It’s hard to say with certainty this was the “hardest cycling” of my life, but it’s got to be up in the top 5. The stats above will hardly show how difficult this section was, but hopefully the video and pics help a bit, at least what few we have. We awoke the first day with tired legs, for we had not yet taken a day off since leaving Chile, but we remained excited to see what else the desert had in store for us. Once we left the Spanish tree-lined oasis of town, we made a slight turn back towards the Andes range. It was a beautiful ride, despite the light headwind, as the monstrous peaks edged closer and closer. The headwind did hold us back though and we reached our planned lunch stop in El Sosneado around 2:00. Here, we ate with a biker gang taking to the Ruta 40. Think of "Sons of Anarchy," but they were drinking beers at lunch (several), and wielding Argentinean flags instead of firearms (that we knew of). They were friendly enough though and, after discarding their many empties, wished us well on our way. Knowing it was about 100 miles until San Rafael, we fueled up on water, snacks, and food to ensure we wouldn’t run out of supplies. We also tried a Red Bull-like beverage called "Speed." It seemed innocent enough to load up on this to ensure we were awake the rest of the day. Weeks later, after reading the can more closely, the warning "do not consume while driving," appeared. I've yet to confirm this... but I'm operating under the assumption this might be an alcoholic beverage. This... certainly did not make the next part of the ride any easier. The next section of road was hell. Upon leaving town, we were met by a ferocious headwind that relentlessly attacked us for the rest of the day. 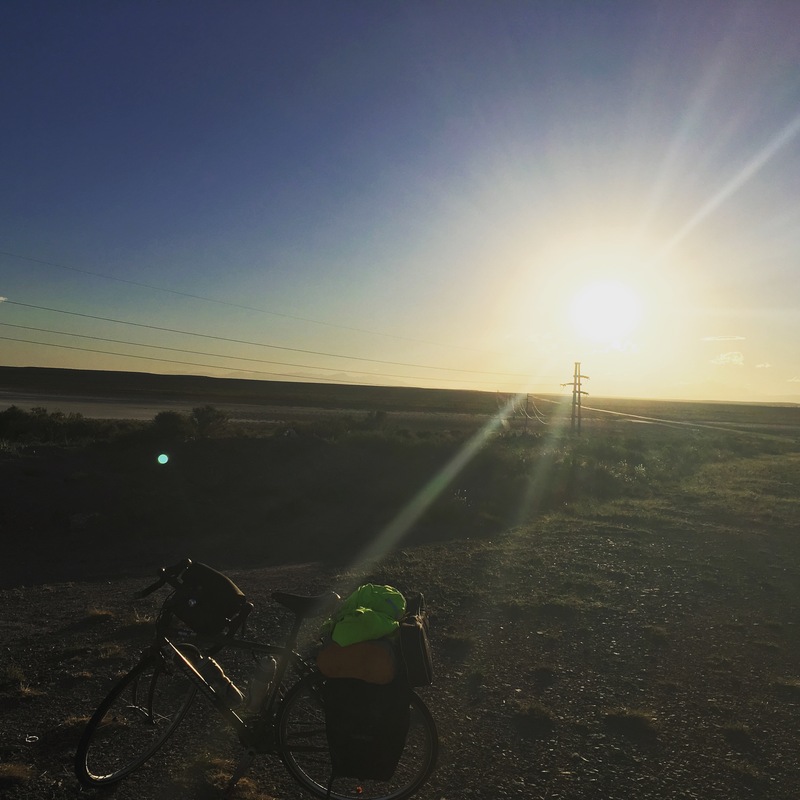 The turn away from the Andes meant we were truly biking through an emptiness of small shrubs and flatness that stretched beyond the horizon. The only comparison I have for this is the sea. As if being lost in the middle of the Pacific with no land in sight and no features save a few rolling waves in the distance. With nothing to look at and a slowed forward progress, we took turns blocking the wind, trading off every 5 kilometers. The only defense appeared to be sugar. We ate Dulce de Leche (basically caramel pudding packets) and Alfajores (Argentine cookies) to force our legs to keep moving and prevent our spirits from dampening. Breakfast of champions? Not exactly, but it did the trick for a while at least. As if the lack of scenery and winds were not enough, buses and trucks whizzed past us without providing any space on the shoulder-less road. One bus came so close I could have reached out and touched it with my elbow (or so it felt!). When the sun fell deeper in the sky, we started looking for a place to camp. The strangest part about the Pampas is that, for some reason or another, the land is completely fenced off starting 15-20 feet from the road. I imagine it is all for ranch land, but it makes it impossible to camp off the road too far. Who on Earth would fence this land? Once or twice, a pickup truck would slide off the road and a Cowboy would walk to the fence and gaze off into the distance. I'm hard pressed to know what he was looking at. As far as I could tell, there was no differences to speak of for days and days or riding. Maybe he was drinking the Speed and just needed to clear his head before getting back behind the wheel? Thankfully, near a huge salt flat, we found a small quarry that was shielded a bit from the busy road and were able to make camp there. That evening, with no light pollution whatsoever, I saw the Milky Way Galaxy in the night sky for the first time ever. I found this to be wonderful and terrifying at the same time. As far as the horizon, millions and millions of stars stretched around us as though we were walking into a dome observatory. The wind continued its punishment when we awoke. It was also much colder than any previous morning (42 f) so we ate breakfast in our tent to try keeping warm a bit longer. After packing up, we pushed onward. The road steadily climbed up into the nothingness of the pampas as cars whizzed by one after another. Finally, we came across a cafe and grabbed coffee and a sandwich. This refreshed us a ton, and it helped that the owner was blasting Led Zeppelin to start his day off right. If only there was a levee to break to give us a bit of water... am I right? From the cafe, we climbed up to the top of a hill in the horizon. Everything changed once we started to descend from the climb. We cut into a beautiful canyon and on the horizon, we saw a lush landscape with trees and vineyards. The Pampas (at least for now) were behind us. As we descended into the outskirts of San Rafael, tons of cyclists coming the other way cheered us on. We made it! After the trials in the Pampas, we decided to take a two day break and see the town. Leaving San Rafael, we followed well marked bike lanes to take us out, but once we turned north on the 143, it was pampas pampas and more pampas all over again. To make matters worse, it was another brutal day of headwinds. You might ask how we could possibly have headwinds entering and leaving San Raf in different directions. I would love to know the answer to that question. To continue dampening and then crush our spirits, it was uphill the first half of the day. I also dropped my ice cream cone, and a stranger came and popped the only balloon left at the fair. As a violin played in the distance, ans a single tear dripped down my face, we peddled forward. There’s really not much to say about the first half, we just ground our way through the bleak landscape and ever blowing wind. Sitting here a few days later, I can say that this is the first moment I truly questioned the meaning of our trip. It was so difficult to stay positive; so tough to keep a level head and remember what we are here to do. At the top of the climb, we finally saw canyons and the Andes came into view through the haze in front of us. The trip down significantly improved. We were thrilled to have sights to see and a lighter headwind to battle against. Sunset behind the hazy Andes was also quite gorgeous. As all mountains do, the Andes robbed us of the last hour of sunlight, so we decided to make camp in a small village outside the main town we were shooting for. It was amazing to camp on soft grass, and that night we ate all the pasta we are carrying. All the pasta. 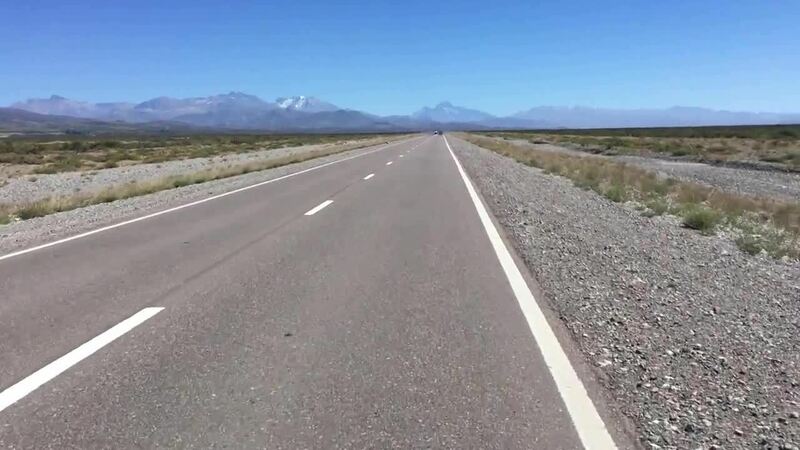 Our last day’s ride into Lujan de Cuyo was marked by another ride along a busy highway. Rejoining the 40, we joined the main artery of traffic into the bustling metropolis of Mendoza. 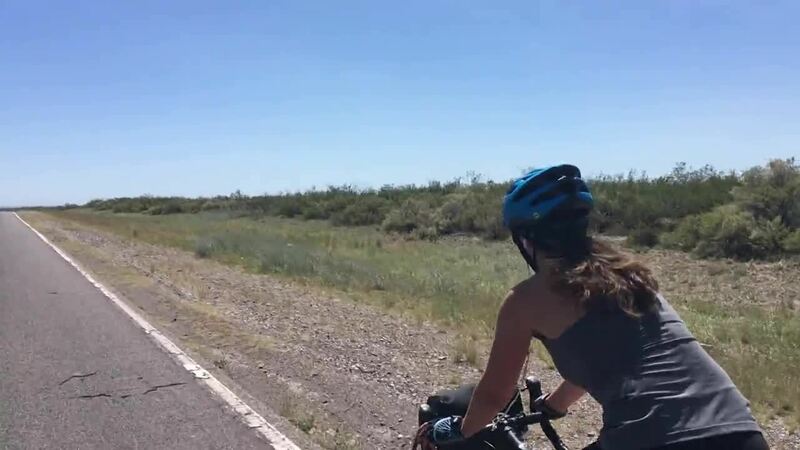 Not all that dissimilar from our riding the Runta 5 in Chile, we were back on the highway, just trying to power through to our end goal and a few days off in Lujan. There isn’t a whole lot to comment on regarding this section. Reaching the small village of Ugarteche, we exited the road and followed the 15 for the last 10 miles. Contrary to what we’d experienced the earlier part of the day, this section was beautiful. The 15 is essentially the wine-tour road and is marked by gorgeous vineyards all the way into town. To make things even better, there is a wide two-lane bike lane along the entire road. Finally… relief from the traffic! If you have a chance to visit Lujan de Cuyo, do it! Like Sonoma in California, this wine country region is a beautiful green landscape tucked at the base of the Andes. No matter how long or short your vacation is, you'll never run out of new wineries to try and Malbecs don't disappoint. We'll write more about this part of the trip shortly.